Guitarist Ronny (Ronnie) Smith has performed with a wide range of artists from a variety of schools of musical thought, including the Marvellettes, Melba Moore, and jazz drummer Bobby Durham. After his albums "Long Time Comin" and "Laid Back" (2002) we welcome his new album "Got Groove" (2006). Ronny Smith doesn't define his personality by his history but by his music. So the best way to get access to Ronny Smith is by listening his new album. Ronny is accompanied by the Ron Smith Group: George Campbell (sax), David Gladding (drums), Chris Rhodes (bass) and Trendle Thomas (keyboards). It Doesn't Matter was originally composed by Chet Catallo for the platinum album "Morning Dance" (1978). Guitarist Catallo was a member of the group Spyro Gyra in their earlier period. Ronny's version is a bit funkier compared to the laid-back original. Ronny's group performed this tune already live in 2002. From these roots we follow Ronny's path with Stringa Lickin Good. Ronny is painting his view of music with precise chords. And when he is running the octaves, the title is understandable. So Special is foremost a journey into instrumental R&B. In the second part of the tune Ronny reaches the fields of jazz turning on the tempo in a fierce improvisation. People Make The World Go Round is a tune which was released first time on Michael Jackson's album " Ben" (1972). This song is very popular in the smooth jazz genre. Artists like Richard Elliot, Bob Baldwin, Walter Beasley, Ron Carter have covered this song but also Marcus Miller, Hugh Masekela or Ramsey Lewis. Ronny Smith's version is featuring George "Wake" Campbell on sax. On Call Me Ronnie Smith shows more of his talent. Starting with a sultry melody he soon dives into jazz improvisation which makes this song vivid. The title song Got Groove is featuring Trendle Thomas on keys. I appreciate that Ronny's band members have some space to expand their solo as Ronny does in a fabulous way. Comparing both previous tunes with the cover Before You Go by George Benson one understands that writing a song is a difficult art. Ronny perfectly masters the finesse of George Benson's original and also shines in guitar solos. With his own compositions like Mountain Road Ronny shows his ability to combine melody phrases with guitar improvisations in a superior way. His affinity for jazz is unmistakable. Do That is the final prove that Ronny's agility, speedness and vituosity need no improvement. 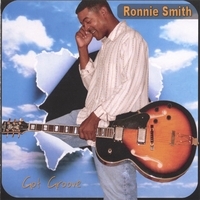 Ronny Smith's album "Got Groove" is a delicacy for all guitar lovers.